Each frame is .1 seconds apart. Leisel Jones' time for this event was 2:20.54, a new world record. The frontal perspective Leisel Jones' stroke verifies what has been seen from previous lateral analyses included in this section of the Swimming Science Journal. The swimmer's stroke is smooth. There are no sudden or jerky movements in the action. She stays low in the water only emerging sufficiently to inhale. Exaggerations of high shoulder lift, shrugging of elbows into the sides of the body, and lunging forward over the water, some of which used to be in her stroke are notably absent. This observation supports the principle that vertical movements in swimming are unproductive and often detrimental. It also illustrates a trend in the world's best breaststroke racers of lessening unnecessary and unproductive movements and swimming smoother. The arm action is wide. The hands do not reposition (Frame #6) until it is possible to have the upper arms powered in abduction and adduction by both the frontal and dorsal rotator muscle groups (Frames #5-#8). The inhalation and recovery of the hands occurs in almost the same amount of time that it takes for the legs to be drawn up to kick. When kicking does start (Frame #12), the head and shoulders have returned to horizontal streamline and the arms are extended forward. The kick propels a swimmer who is creating minimum frontal and surface resistance. The stroke is completed fully. The hands do not start to open until the legs trail straight behind in streamline (note that they are not tight together but do maintain the streamline down each side of the swimmer). The outward movement in the early part of the arm stroke is not accomplished with straight arms. There is a slight bend in the elbows. That allows a more powerful opening that flows naturally into repositioning both arms to affect a large horizontal thrust with the arms. The major propulsion from the arms is rearward (Frames #6 and #7). The forearms play the major role of the propelling surface. 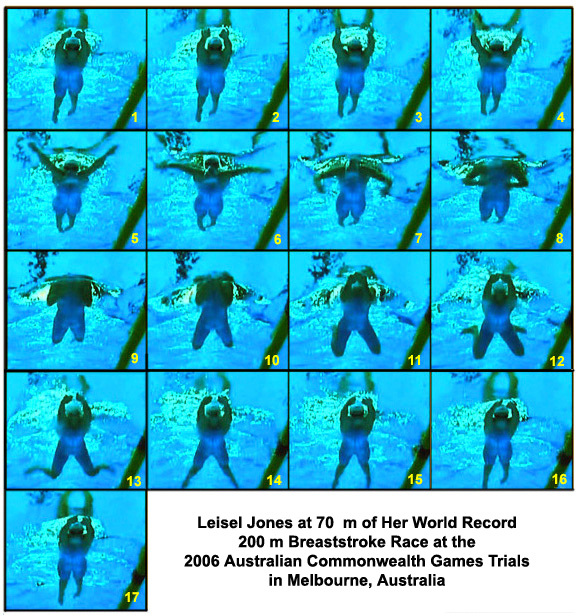 Leisel Jones' does not swim with a "hands-oriented" stroke. Although the arms are not vertical in the frontal or lateral planes, their major force component is horizontal. As with other great swimmers, Frame #7 displays a position that is similar to that attained by good butterfly swimmers. Leisel Jones is likely to improve further on her world records because she only needs to execute the total stroke cycle in a shorter time (meaning her actions will entail greater accelerations). Any attempt to isolate a part of this movement and emphasize it (e.g., speeding the arm spread to initiate the stroke, or move the hands faster around the turn at the end of the stroke) would cause the summation of forces to be disrupted, which would cause the swimmer to slow rather than go faster.